What size electric radiator do I need? To heat your room effectively you will need to choose radiators with a high enough wattage to efficiently heat the space. To calculate the wattage required to heat your space you can use our interactive radiator calculator, which will calculate the required wattage based on the dimensions of your room and your property type. You will then need to choose a radiator or combination of radiators which add up to the required wattage. If your wattage calculation is on the borderline between two sizes we always recommend choosing the larger radiator. Under-specifying your heating will either leave you cold or will overwork your radiators, wasting energy and shortening their lifespans. Larger radiators will simply spend less time switched on, saving you money whilst maintaining comfortable temperatures. Please be aware that the radiator calculator is for guidance only. We cannot guarantee that the recommended wattages will heat your home effectively. If in doubt, seek the advice of a qualified electrician. Can I put an electric radiator in my bathroom? We do not recommend electric radiators for bathroom installation. This is because there is the temptation to hang towels over the appliance to dry, which can obstruct ventilation on the heater and cause a hazard. In most bathrooms, electric towel rails provide a more practical option, making better use of the space. They give you somewhere to hang your towels while also keeping the room toasty and warm. All towel rails for bathroom installation must be installed by a professional electrician. What are the best electric radiators for rooms with high ceilings? Rooms with high ceilings can be difficult to heat because they hold a much higher volume of air: this means it takes more power to raise the ambient temperature of the air. 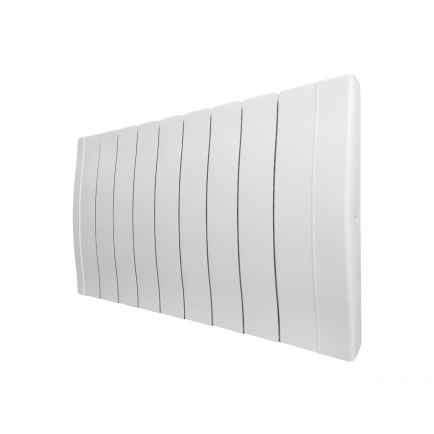 Our Haverland Inerzia radiators are specifically designed for rooms with high-ceilings. Instead of using a thermal fluid or solid state aluminium elements, the Inerzia range heats using lightweight ceramic stones. These stones boast excellent heat retention properties and throw out heat at a higher intensity than other heating elements, packing more power into the radiator’s compact body and providing the oomph needed to fill the entire room with warm air. The Inerzia is an excellent choice for Victorian terraces, open-plan living areas, high-ceilinged offices, stairwells, hallways and community halls. What’s the difference between dry thermal and thermal fluid heating elements? At Electric Radiators Direct you’ll find electric radiators using a variety of different heating elements. Each of these elements has its advantages and may be the best choice for you depending on the space you want to heat. Dry thermal elements include the lightweight aluminium wire elements found in the Haverland RC Wave and the ceramic stones used inside Electrorad Aeroflow radiators and Haverland Inerzia radiators. Dry thermal elements typically heat up faster than thermal fluids, making them the best choice for precision heating and fast heat-up times. Aluminium elements have the advantage of being particularly light, allowing you to mount radiators such as the RC Wave on stud or partition walls. On the other hand, ceramic stones retain heat for longer than aluminium strips, making them a good choice for heating high-ceilinged and open plan spaces. Thermal fluid elements are used inside our Haverland TT and Electrorad Digi-Line electric radiators. It's a common misconception that thermal fluid radiators use plumbing or pipes. The liquid element is entirely contained within the radiator body, which simply plugs into the wall like all our other electric radiators. Thermal fluids ensure an even heat distribution across the room. They also retain heat well, making them an energy efficient choice in larger rooms you use regularly. Can I use electric radiators to heat my hallway? Rooms with a staircase can be difficult to heat because you’re effectively trying to heat two floors: the room will have twice the volume of air as a room of the same dimensions with only one floor. Because heat rises, a radiator placed at the top of the landing will do little to heat the hallway downstairs. Likewise, a radiator placed at the foot of the stairs will send most of its heat upstairs. The best way to achieve balanced and consistent heating across your hallway, staircase and landing is to use two electric radiators: one at the bottom of the stairs and one at the top of the landing. If in doubt, consult your electrician. What’s the best electric radiator to use in a conservatory? Electric radiators can be a good choice for conservatory heating because they can be retro-fitted without the need to extend the plumbing from your central heating system. All of our electric radiators are suitable for use in a conservatory. However, the Haverland Conservatory RC12B Electric Radiator is specifically designed to fit on conservatory dwarf walls. Do I need a programmable electric radiator? Always make sure you purchase electric radiators with control and programming facilities. Programming your radiator can save you so much money that cheaper radiators without programming controls will quickly cost you more money in running costs. We strongly recommend choosing radiators with programming control so you do not waste energy by leaving them on all the time. 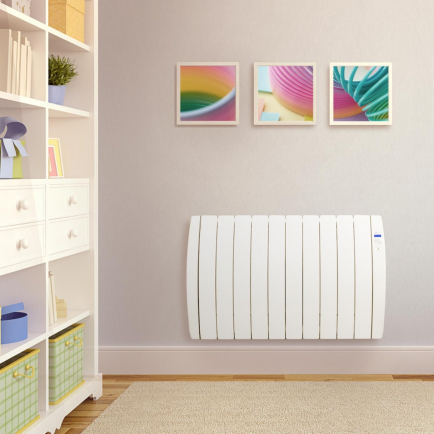 What’s the best electric radiator for homes on a budget? 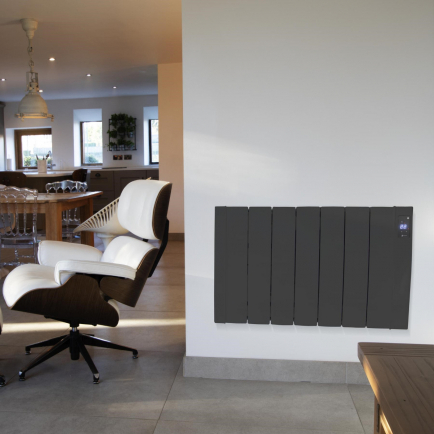 Our best-selling electric radiator, the Haverland RC Wave, is perfect if you're looking for energy efficient radiators on a budget. The RC Wave uses dry thermal heating technology, a high precision thermostat and full programming controls to provide energy efficient heating to every room in your house. The RC Wave also boasts a slimline aesthetic, making it easy to install in any room you see fit. 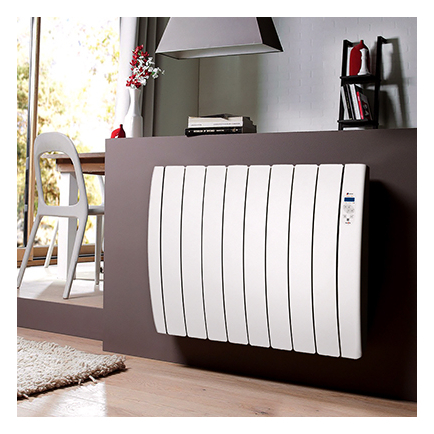 The RC Wave is an excellent all-rounder if you want a great value heating solution that will still save you money. If you are looking for quality, control, reliability, easy installation and of course sensible running costs you’ll find an unrivalled selection of energy efficient electric radiators tailored to your every need here at Electric Radiators Direct. From free standing to wall mounted electric radiators, from contemporary designs to radiators with more traditional aesthetics, and with a wide range of energy management systems including precision digital thermostats, 24/7 programming facilities and state-of-the-art self-learning technology, there’s a radiator for every application in our unrivalled electric heating collection.